I am now a Senior Scientist at the Qatar Computing Research Institute. by the President of Bulgaria. Research Interests: Computational Linguistics, Natural Language Processing (NLP), Lexical Semantics, Machine Translation, Web as a Corpus, Bioinformatics, and BioNLP. ACM TSLP: Semantic Interpretation of Noun Compounds Using Verbal and Other Paraphrases. Preslav Nakov and Marti Hearst, ACM Transactions on Speech and Language Processing, 10(3):13:1-13:51, July 2013. NLE: On the Interpretation of Noun Compounds: Syntax, Semantics, and Entailment. Preslav Nakov, Natural Language Engineering, 19(3):192-330, July 2013. JAIR: Improving Statistical Machine Translation for a Resource-Poor Language Using Related Resource-Rich Languages Preslav Nakov, Hwee Tou Ng, Journal of Artificial Intelligence Research (JAIR), vol. 44, pp. 179-222, May 2012. Advances in Bioinformatics: Do Peers See More in a Paper than its Authors? Anna Divoli, Preslav Nakov, and Marti Hearst, Advances in Bioinformatics, 2012. 2014: EACL'2014, EACL-SRW'2014, MWE'2014, LT4CloseLang'2014. DeepLP4QApp'2014. 2013: ACL'2013, NAACL-HLT'2013, EMNLP'2013, SIGIR'2013, IJCAI'2013, IJCNLP'2013, RANLP'2013, CICLING'2013, *SEM'2013, SemEval'2013, ACL-SRW'2013, RANLP-SRW'2013, WMT'2013, MWE'2013, WAC'2013, TextGraphs'2013, MUMTTT'2013, AICCSA'2013, NLP&LOD'2013, MIE'2013. SemEval'2016: 10th International Workshop on Semantic Evaluation, co-chair. MWE'2016: 12th Workshop on Multiword Expressions, at ACL'2016, co-chair. RANLP'2015: Conference on Recent Advances in Natural Language Processing, co-organizer. SemEval'2015: 9th International Workshop on Semantic Evaluation, co-chair. DiscoMT'2015: Shared Task on Pronoun Translation, co-organizer. LT4VarDial'2015: Joint Workshop on Language Technology for Closely Related Languages, Varieties and Dialects, co-chair. LT4VarDial'2015: DSL Shared Task 2015 on Discriminating between Similar Languages, co-organizer. EMNLP'2014: Conference on Empirical Methods in Natural Language Processing, local co-organizer. SemEval'2014: 8th International Workshop on Semantic Evaluation, co-chair. LT4CloseLang'2014: EMNLP 2014 Workshop on Language Technology for Closely Related Languages and Language Variants, co-organizer. JNLE: 2013 Journal of Natural Language Engineering, special issue on the Semantics of Noun Compounds, guest co-editor. RANLP'2013: Conference on Recent Advances in Natural Language Processing, co-organizer. *SEM'2013: Second Joint Conference on Lexical and Computational Semantics, area co-chair for Morphology/Semantics Interface. ACL-SRW'2013: ACL 2013 Student Research Workshop, faculty advisor. NLP&LOD'2013: RANLP 2013 Workshop on Natural Language Processing and Linked Open Data, co-organizer. RANLP'2011: Conference on Recent Advances in Natural Language Processing, co-organizer. AISB'2011: Artificial Intelligence and Simulation of Behaviour Convention, track co-chair. LLMMC'2011: Symposium on Learning Language Models from Multilingual Corpora, co-organizer. RELMS'2011: Workshop on Relational Models of Semantics, at ACL'2011, co-organizer. IEKA'2011: Workshop on Information Extraction and Knowledge Acquisition, at RANLP'2011, co-organizer. MWE'2011: Workshop on Multiword Expressions: from Parsing and Generation to the Real World, at ACL'2011, consulting body. AIRS'2010: The Sixth Asia Information Retrieval Societies Conference, publication chair. MWE'2010: Workshop on Multiword Expressions: from Theory to Applications, at COLING'2010, co-organizer. MWE'2009: Workshop on Multiword Expressions: Identification, Interpretation, Disambiguation and Applications, at ACL/IJCNLP'2009, co-organizer. SemEval'2016, task #3 on Community Question Answering, co-organizer. SemEval'2016, task #4 on Sentiment Analysis in Twitter, co-organizer. SemEval'2015, task #3 on Answer Selection in Community Question Answering, co-organizer. SemEval'2015, task #10 on Sentiment Analysis in Twitter, co-organizer. SemEval'2014, task #9 on Sentiment Analysis in Twitter, co-organizer. SemEval'2013, task #2 on Sentiment Analysis in Twitter, co-organizer. SemEval'2013, task #4 on Free Paraphrases of Noun Compounds, co-organizer. SemEval'2010, task #8 on Multi-Way Classification of Semantic Relations Between Pairs of Nominals, co-organizer. SemEval'2010, task #9 on Noun Compound Interpretation Using Paraphrasing Verbs, co-organizer. 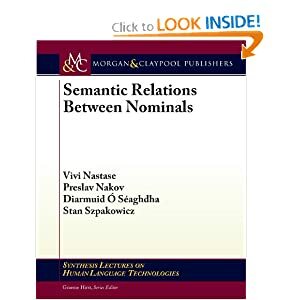 SemEval'2007, task #4 on Classification of Semantic Relations between Nominals, co-organizer. December 10, 2015: SAIL @ MIKE'2015 (Hyderabad, India), keynote talk: "Sentiment Analysis on Twitter: a SemEval Perspective"
July 30, 2015: Novel Computational Approaches to Keyphrase Extraction Workshop, co-located with ACL 2015 (Beijing, China), keynote talk: "The Web as an Implicit Training Set: Application to Noun Compounds Syntax and Semantics"
July 22, 2015: 13th International Linguistics Olympiad, IOL'2015 (Blagoevgrad, Bulgaria), invited talk: "Statistical Machine Translation"
June 29, 2015: AComIn Workshop on Big Data in NLP, Education and Digital Collections (Sofia, Bulgaria), invited talk: "The Web as an Implicit Training Set: application to noun compounds syntax and semantics"
June 5, 2015: Fourth Joint Conference on Lexical and Computational Semantics (*SEM'2015) (Denver, Colorado, USA), keynote talk: "60 Years Ago People Dreamed of Talking with a Machine. Are We Any Closer?" May 29, 2015: International Conference on Computational Linguistics, Dialog'2015 (Moscow, Russia), keynote talk: "Sentiment Analysis of Social Media Texts: a SemEval Perspective"
May 28, 2015: International Conference on Computational Linguistics, Dialog'2015 (Moscow, Russia), round table talk: "Linguistic Analysis of Social Media Texts"
April 26, 2014: 10th Workshop on Multiword Expressions (MWE'2014), (Gothenburg, Sweden), invited talk: "The Web as an Implicit Training Set: Application to Noun Compounds Syntax and Semantics"
July 23, 2015: Data Science Society (Sofia, Bulgaria), invited talk: "The Web as a Training Set"
June 25 and 26, 2015: Software University (Sofia, Bulgaria), guest lecture in the course on Data Structures: "Data Structures, Algorithms and Complexity"
June 22, 2015: Summer School in Informatics for preparation of the extended Bulgarian national teams (Sofia, Bulgaria), lecture: "Algorithmic Games"
May 26, 2015: ABBYY (Moscow, Russia), invited talk: "The Web as an Implicit Training Set"
September 11, 2014: University of Bergen (Bergen, Norway), guest talk and a master class: "The Web as an Implicit Training Set: Application to Noun Compound Syntax and Semantics"
July, 2010: NICTA and The University of Melbourne (Australia). February, 2010: University of Wolverhampton (UK). January, 2010: University of Cambridge (UK), University of Karlsruhe (Germany), and University of Stuttgart (Germany). November, 2009: NICT, Kyoto (Japan). My advisor at Berkeley was Prof. Marti Hearst.